J wants to know whether it's OK to use quotes from scientific books and journals, and mention the authors of those quotes. Stick around for the answer. Hi, I'm Entertainment Attorney Gordon Firemark, and this is Asked and Answered, where I answer common entertainment law questions to help industry professionals like you, take their careers to the next level. I wrote/directed a short film showing some behavior of a mental dissorder. I want to list some researchers and/or doctor's quotes and stats laid over the ending footage. I got the quotes off of medical sites on the internet.. is it safe to use them? A: Well, this can be a tricky situation. I don't know if I'd automatically trust quotes I got off the internet, without some independent confirmation that they're accurate quotes. It's probably best to go to the original sources. You could do this yourself, or hire a medical student or something to spend a few hours at the library verifying the quotes. Can you use them without infringing copyright? Well, this depends on the quotes. Nobody can give you a hard-and fast answer without reviewing them. You see, copyright law protects the original expression of ideas, but not the ideas themselves. So it really depends on whether a particular quote is truly “original” expression. Then, we have to look at how much of the work the quote came from is involved. If you quote 1 line from a book, it's probably going to look like a fair use, but if it's 1 line from a single-page document, it might not. Can you identify the authors of the quotes? Sure. as long as you're careful not to create any impression that they're endorsing you or your film. But, don't get the idea that giving attribution will help you escape copyright liability. If what you're doing infringes copyright, the attribution will work as the “smoking gun” that proves you KNEW the work belonged to the author. It's probaly smarter to just ask for permission, and get a simple release form signed, so you're free and clear. Most academics will be glad to be quoted in your film. Hey, do me a favor. Subscribe to my YouTube Channel. It's easy, Just click the button. And, If you'd like to Submit YOUR question, go on over to firemark.com/questions. Kindergartens must have upped their game. It seems they're teaching negotiating skills. At least, that's what you'd conclude from talking to my five-year-old. He has an uncanny knack for getting what he wants. Here are a few tips I've picked up from observing my kids in the wild. I think they apply equally well to the art of negotiating deals in show business. Kids are great at asking for, demanding, actually, the things they want. Negotiations always start with an ask. It makes sense to ask for everything you want from a deal, even if you don't expect to get exactly what you've specified. Persistence pays off. It's not just about wearing the other side down. If it's really a “must have” item on your list of deal points, you can't give up. Either you get what you need, or,the deal isn't worth doing. If the other side won't give in, take your ball and go home. When my 5 year old wants something, he wisely (sometimes) evaluates my mood and ability to respond favorably before jumping in with his demands. Just as it's important to know what you want and must have in the deal, you need also to have a good sense of the other side. Their wants and needs are the other moving parts in the negotiation. If they aren't able to concede on a point, and it's not a must-have for you, it's wise to recognize this, and use the point as a “give” to get compromise in some other area that's important to you. If the other side can't or won't give a point, and is ready to walk away from a deal over something you don't absolutely need, the smart move is to take no for an answer and refocus your energies on points the other side can give. Digging in on a point of contention isn't good for the overall outcome of a negotiation. When arguing with his younger sister over a particular toy to play with, my 5-year old is often heard to say “why don't we play with it together”, or If I let you have a turn, I get to have a turn later, okay?” By allowing her to have something she wants, he's able to get (mostly) what he wants, too. If a party isn't willing to give on any points, and is dug-in on it's original position without showing any willingness to move, you're not in a negotiation. You've been given an ultimatum. When faced with an ultimatum, there's only one consideration… whether the other side has sufficient leverage to coerce you into performing. If not, walk away. There's no “deal” here. Just a price. Acknowledge a good deal, and express your good feelings about it. “Yay! I'm so excited I get a super-duper-doohickey-thingamabob!” he shouts, telling anyone who'll listen (and often those who don't care to). His exuberance and happiness is infectious, and makes me glad to have been able to give him something he wants. It's a nice feeling. Acknowledging the success of the negotiation is the classy thing to do, even if you're not exuberant, and shouting it from the rooftops. A simple, “Thank you. It's going to be great to work on this project together. I'm really excited about this opportunity.” can make a real difference in how the relationship proceeds. If the deal is truly a win-win for everyone involved, you've established the foundation on which to build a strong, positive working relationship, and maybe even a friendship. If things go well, and you're friendly and congenial about everything, there's even the possibility of working together on other things in the future. Offering the olive-branch only makes sense. I'm not suggesting that we behave like 5 year olds when we negotiate deals for our work in the film, television or theatre business. But there are things we can learn from watching how kids interact, especially with us. 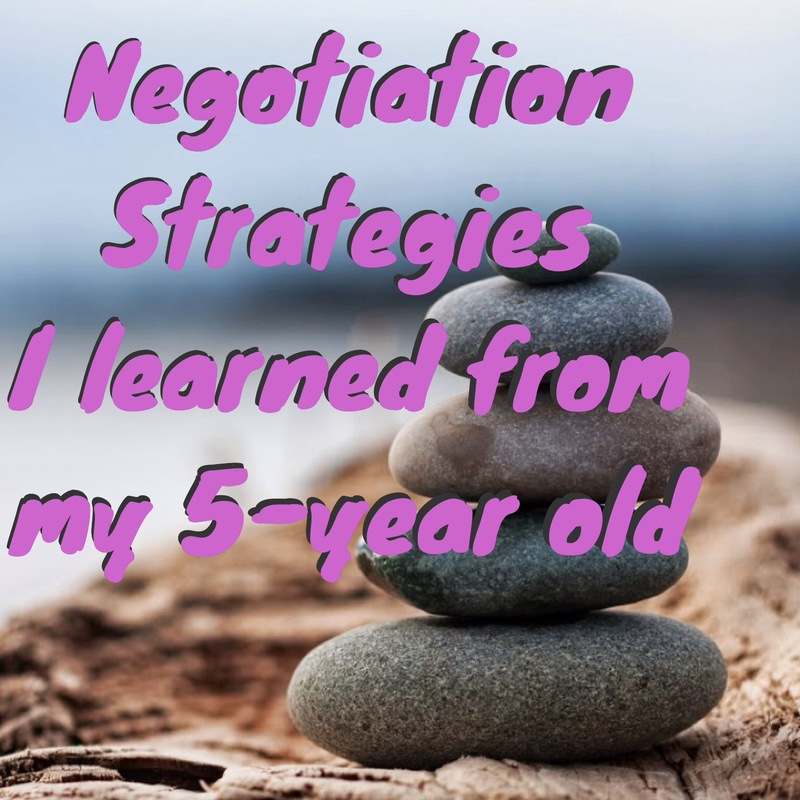 So, next time you're stuck for what to do in a negotiation, ask yourself, “What would a kid do to get the most out of a deal?” You might be surprised how well it can work. Cheating people shouldn’t be the way you succeed. As you know, I am sometimes led to rant a bit about the state of the entertainment business, or more particularly, the mental state(s) of some of the people IN the industry. In recent weeks, I've been asked to negotiate deals for a handful of relatively new artists, and I've been disheartened by what seems to have become the norm for deals with these kinds of folks. They're getting screwed, and everybody knows it. It's one thing to get a low-ball offer from an independent producer. This isn't news. It's been happening for decades. In my representation of indies, I've drafted enough of these offers to know. But usually, the low-ball front-end of the deal was offset by fair and reasonable terms later in the development and production cycle, and of course on the back-end. So, where a first-time screenwriter might have given a producer a free option for a year or two, the renewal payments and purchase price would, generally, be fair, and if the writer were expected to prepare rewrites, there'd be some reasonable compensation for that work at some point in the deal. The up-and-coming talent was being asked to share some of the risk that the project would fail to receive funding, or founder for some other reason, but they'd get to share in the up-side if the project got made. Fair? Reasonable? Probably. Well, apparently those days are gone. Just because you can take advantage doesn't mean you should. It seems that some producers and financiers have decided that, simply because they can get away with offering lousy deal terms from beginning to end, they should. “Business is Business”, they say. Taking advantage of people is not good business. Ultimately, in fact, it is the opposite, since it sets up the project on a foundation of intimidation and distrust. And that is bad for the quality of the work. Moreover, paying creatives too little leads them to deliver poor-quality work. It's a fact. They want to do great work; make great art, but if a writer can't pay his rent on the option money, he's got to go to a day-job to make ends meet. That leaves his “off-hours” for the writing. When a writer is tired, frustrated, and burnt-out from a day (or night) at work waiting tables, tending bar, driving a cab, or whatever, do you really think the written material he creates is going to be his best? The same is true across all of the entertainment trades. Directors, Editors, Composers, Actors all need to earn a decent, living wage from the work they do, so they can remain focused on that work. Isn't that focus an essential ingredient in producing good material? Appropriate Pay is good for the business. Paying people a fair and reasonable price for their property, or fee for their services, on the other hand, sets everything up to go forward in a way that satisfies both the artistic and the business needs of the project. Happy people do better work. Besides, if you can't afford the raw materials, the labor, etc., isn't that a sign that you're either not serious about the project in the first place, or you don't have the funds needed to do it right? It's time for us all to draw the line. No more bottom feeders. Who's with me? Asked & Answered: Movie line as a song lyric?